Ah, romance! 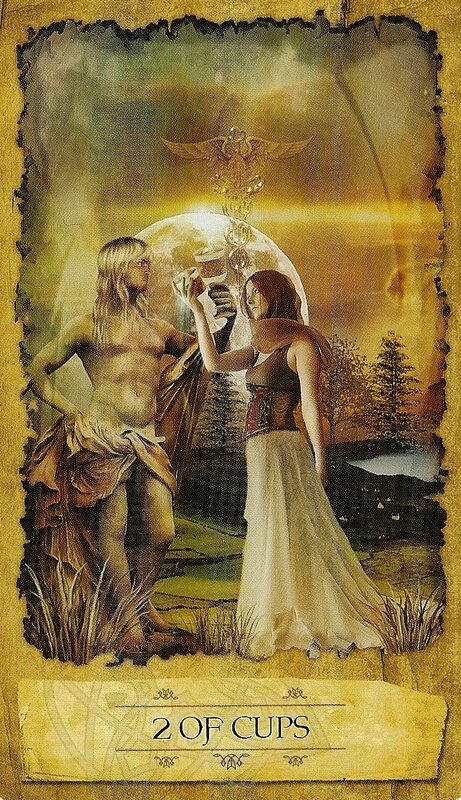 That is everyone’s first thought as they draw the Two of Cups; and indeed, that is one of its best known definitions. That is not the only one. 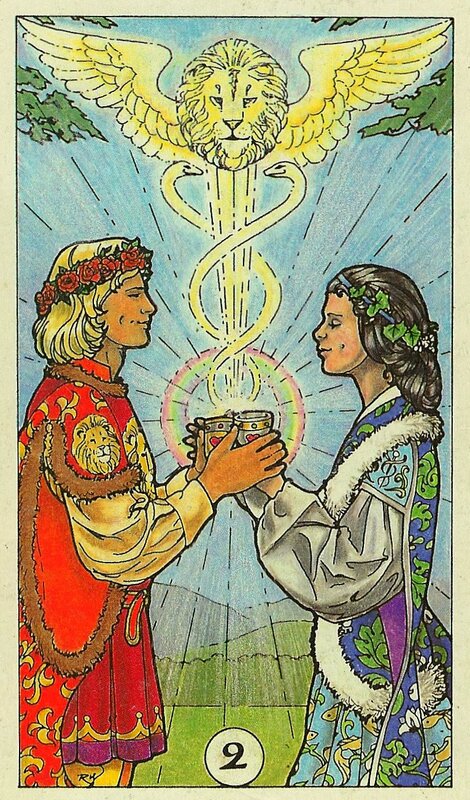 Of course the suit of cups represents emotion, the subconscious mind, intuition, the subtle connection between all life-forms, and of course, that most fluid of usual subjects for readings: relationships. And of course, there is the traditional meaning of the number two- receptive, open, twin souls, or pillars flanking a gate- either way, partnership is clearly indicated, even in a world defined in large part by polarity. Two is the number of complimentarity, of opposites that draw each other close or push each other away. It is the first number that clearly shows the presence of the other. In this post I intend to compare the 2 of Cups in four different decks, partly to compare the similarities and differences, and partly to show how different interpretations may apply according to the designers’ visions for each different deck. I will start with the Cosmic Tarot by artist Norbert Losche. His characters often bear a strong resemblance to old time movie stars, and his visions for his cards are so dramatic. I think ol’ Norbert must have a real soft spot for old fashioned romance. In his rendering of the 2 of Cups, a very debonair man is portrayed in what appears to be a luxurious, romantic-era dressing gown, and he is romancing a beautiful lady, who all but swoons in his arms. (Sappy, but effective, and who can deny their secret longing to be swept away in just this fashion?) Two chilled goblets in the foreground sweat drops of condensation among flowers that crowd them together, and the glow from the two goblets unite to form one beautiful dome of light. Blooms swirl around the heads of the lovers as they loose themselves in the ecstasy of the moment. Ah, Love! A distant ocean melts into a starry night sky, and planets float in the background. The isolation of the lovers is perfect as the rest of the world disappears. 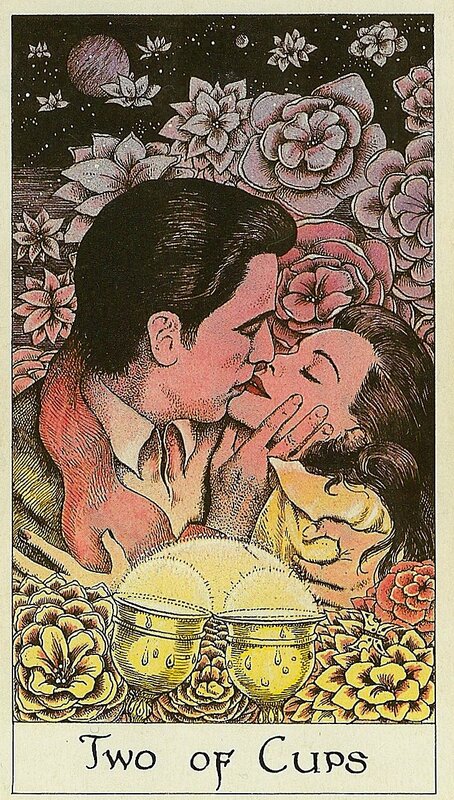 This is the most classic interpretation of the 2 of Cups- the one everybody who has ever had a relationship reading hopes for. It comes complete with everything except “…and they lived happily ever after…” unless it falls in the ultimate outcome position. 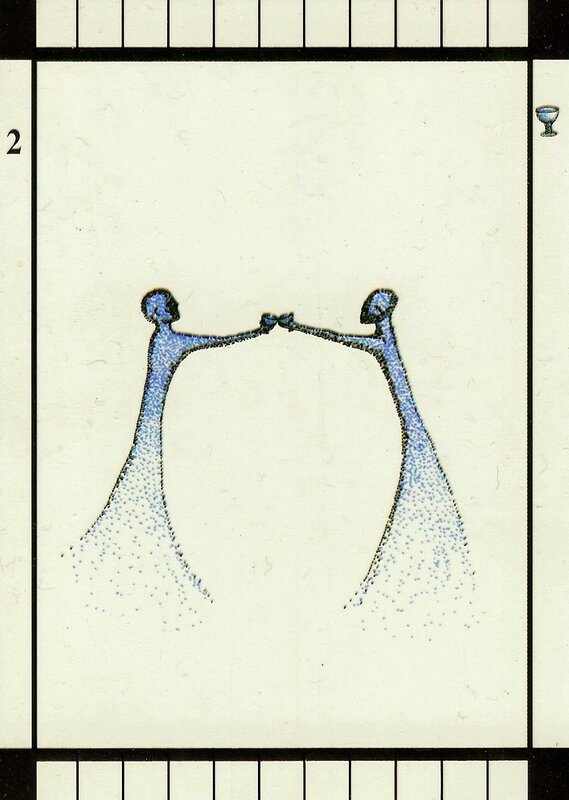 Again, sticking to tradition, but a bit less overblown, is Robin Wood’s take on the 2 of Cups. Two very attractive young people toast each other, smiling and surrounded by light. Their hands entwine as they hold up two beautifully matched goblets- they are not identical, but clearly complimentary, and made for each other. The power of this contact casts a ring of rainbow light around their cups and sweetly clasped hands. A smooth green lawn and distant mountain landscape in the background indicates that whatever awaits them, they have each other, and will travel together through both easy and difficult times. The raising of kundalini energy is indicated in the caduceus that climbs rays of light toward the winged solar lion’s head hovering golden in the sky. His red and golden garments and golden hair show his fiery passionate nature, and she is crowned with the leaves and adorned with the flowers and vines of earth, showing that she is thoughtful and creative. When spirited fire is grounded, the earth brings forth it’s gifts. Energy is wedded with matter, and vice versa- you can’t have one without the other, and together they make all things manifest. It should also be taken into consideration that twos often represent choices as well as romantic possibilities. I am reminded by the writings of Janina Renee, a favorite tarot scholar of mine, that sometimes this card signals the need to accommodate another, to consider their needs and desires, to compromise and make changes in your behavior in order to draw closer together. Most of the time, though, I consider it a matter of obstacles or timing. He shows up with flowers, just after you’ve pulled a double shift at the print-shop. He’s in a dinner jacket and you’re covered in ink. He’s got reservations to a dinner theater, and shows up unannounced, and you’ve just ordered a pizza and climbed into your jammies. Get over it; either clean up and go, or call for another pizza, and give the tickets to your favorite neighbors. This entry was posted in archetypes, cartomancy, Cosmic Tarot, differing interpretations, Divination, fortune, interpretation, Mary K. Greer, Metaphysical, Mystic Dreamer Tarot, readings, religion and spirituality, Robin Wood Tarot, Romantic Interests, Spiritual, Synergy, tarot, tarot interpretation, tarotcircle, Transparent Tarot and tagged caduceus, Complete Book of Tarot Reversals, complimentary, Divination, emotions, healing, Intuition, Janina Renee, love, love interest, Mary K. Greer, Mystic Dreamer Tarot, passionate, polarity, readings, relationships, Religion and Spirituality, romantic, soul-mates, Suit of cups, Tarot, thoughtful, transformative. Bookmark the permalink.